I love summer cocktails, mostly because there is such an array of pretty ones to mix up and serve to my friends. I find a signature cocktail is a fun way to begin a dinner party on a festive note. The Pimm’s Cup has to be “the” quintessential English summer libation and a perfect warm weather cocktail. This is a terrific cocktail for July 4th – double or triple it, accordingly, for a crowd. Inspired by a gorgeous photo of a Pimm’s in a summer issue of Bon Appetit last year, I mixed up a batch, working on an eye-catching garnish. This is a deceptively strong cocktail, so I took a hint from BA and added some ginger beer, my favorite British soft drink. You can substitute sparkling water for the ginger beer, adding just a teaspoon of super-fine sugar. 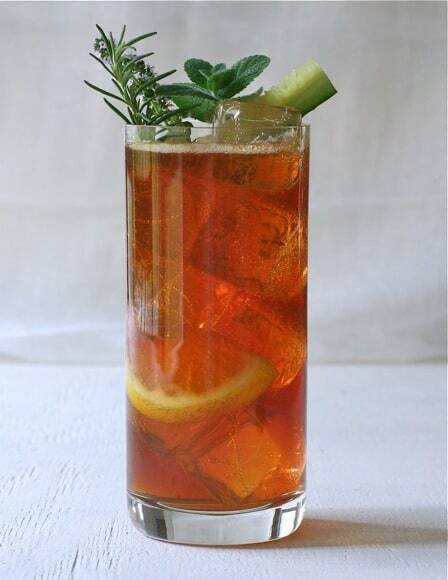 I used cucumber, the classic Pimm’s garnish, and added some herbs from the garden as well. My orange thyme was in flower and the pineapple mint needed pruning. I only wish my Tuscan rosemary had been blooming. Have fun concocting your own version. Many thanks to Laura of Family Spice for her patient, helpful and inspirational photo tips. TIP: Buy Pimm’s No. 1, a fruit and herb-infused gin, at most liquor stores. It is a little price-y, about $20, but you can store the opened bottle in your liquor cupboard until your next summer happy hour. The quintessential English summer cocktail, the Pimm's Cup. Place cucumber pieces in a cocktail shaker and mash with the end of a wooden spoon. Add Pimm's and lemon juice. Fill 2 tall glasses with ice and set aside. Add ice to Pimm's mixture, cover and shake for 20 seconds. Strain and pour into 2 glasses. Add some ice cubes, then a lemon slice and finish with more ice. Top off each glass with ginger beer. Okay, now I have to get some Pimm’s and see what the fuss is about! Looks great, Liz! Glad I could help and you were able to understand my ramblings! Of course – see my cheesecloth? Oh, I hope you do – Mission Hills Liquor sells the Pimm’s #1…Happy 4th! Great photo Liz! Looks very summery, I especially like the herb finish. Do you enjoy them in London, Jayne? Pimms is very popular here but not sure if the way it’s served is the same as a Pimms cup. I’ve only tried Pimms once, years ago at the Chelsea flower show. Interesting – will have to research, Jayne – enjoy the weekend. Liz, that photo is fantastic. I want to drink this right now! Wish I could serve you one, Lynda. Liz! Great photo my friend 🙂 Love the white on white, really brings the drink out. I have never made one of these and I really must make one considering my hubby is a brit….we’ll see. I have a houseful right now for the 4th and I am enjoying it for a change! This is the perfect summer drink! I haven’t had one in years, and used to LOVE them. I love the look of your recipe and will make these this week!! This is one of the all-time classic summer cocktails. Haven’t had one for years, thanks for reminding me how beautiful they are. PIMMS is on the shopping list! Lovely photo Liz! And the drink sounds so refreshing. I might have to try it for our next jazz in the park picnic. Happy summer! Thanks, Lisa – hope to see you soon. Ditto, plus it’s humid – perfect Pimm’s weather indeed. Oh my gosh! It has been TOO long since I had a Pimm’s Cup! Thanks for sharing, Liz! It looks amazing. Ahh how I miss Pimm’s.